Killantringan Lighthouse is situated in southwest Scotland, 10 miles southwest of Stranraer, 4 miles north of Portpatrick. The lighthouse was completed in 1900 to designs of David Alan Stevenson, to help shipping navigate the North Channel of the Irish Sea. As well as a light flashing every 30 seconds, the lighthouse was fitted with a powerful fog horn. 1987 - the fog horn was decommissioned. 1988 - the light was automated. 2005 - the General Lighthouse Authority took the decision to stop operating the light at Killantringan. 2007 - the light was donated for use abroad. The building was sold at that time to serve as holiday accommodation. 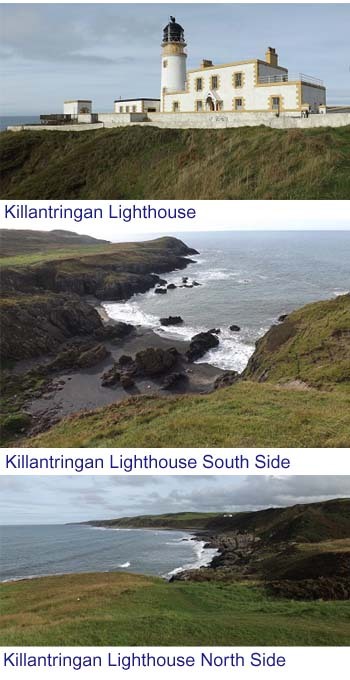 The image second top is from Killantringan Lighthouse showing the coastal path south towards Portpatrick, 5 miles in distance. This is part of the Southern Upland Way. Walk Guide. The image bottom shows the vast Killantringan Bay with its long sandy beach on the north side of the lighthouse.